Local elementary school students took a musical journey through Latin America thanks to Assistance League of the Chesapeake. Students at Meade Heights Elementary and Georgetown East Elementary schools were treated to performances by Cantare on February 7 and 8, which were hosted by our chapter through an Art-in-Education Program grant from the Arts Council of Anne Arundel County. 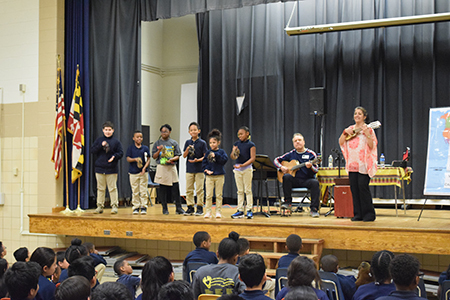 The performance, “Mucha Musica,” introduced the students to the culture and countries of Latin America through instruments, music, song, and dance. Students joined in (seen here at Georgetown East) and even the teachers got into the act! The musical instruments included goat-toenail rattles, donkey jaws and armadillo shell guitars. Cantaré’s interactive performances draw from the musical heritage of the Caribbean, Central and South America. Cantaré performs an entertaining blend of songs in Spanish and Portuguese, while sharing the music’s cultural and historical background. 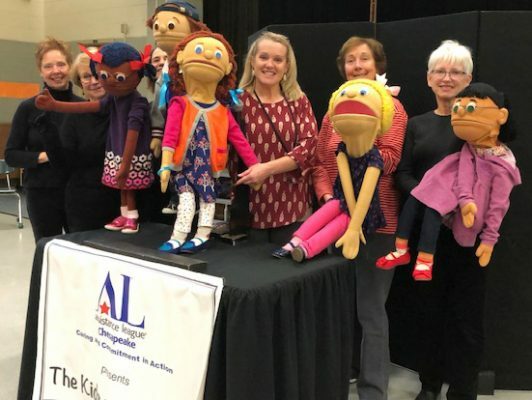 Assistance League of the Chesapeake acknowledges the Arts Council of Anne Arundel County, the Maryland State Arts Council, the City of Annapolis and Anne Arundel County for this wonderful opportunity to bring an afternoon of culture and music to the students.